This was the first week where I forgot how far along I was a few times. I suppose once you get into the 20’s and 30’s, they all start blurring together? Food Cravings: Burgers, Guzman y Gomez (I don’t know if that was a craving as much as an awareness that they were having $5 burritos all week…), coooooooold water. Symptoms: Allergies. Insomnia on Monday night, which was annoying. 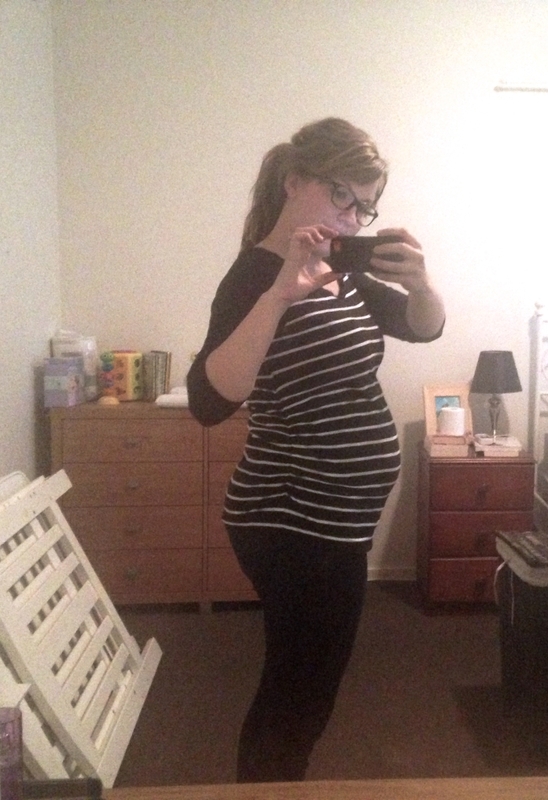 Thursday I got quite overheated and had a brief return of the lovely nausea and fatigue of the 1st trimester. I was able to rest for a few hours, and it fortunately went away. New this week: We picked up a different dresser on Tuesday. We got the other one home and quickly realised it wasn’t going to be enough storage. We put it back up on Gumtree and then in the yard sale today, and it has thankfully sold! I kept looking, though, and I found a really nice one on Gumtree that is perfect. It’s in great condition from a really nice store, and it was in a nice home prior to us buying it. We’ve also been given lots of clothes to look through from friends, which is fun. I am finding that I have to be really picky, otherwise we would have enough clothes for 4 babies! I am mostly choosing neutral type stuff that will work for either, but if I see a boy or girl item that is just simply awesome, I snag that, too. We now have 3 of the 8 drawers filled with baby clothes…oh dear. My parents sent us a package as well, and it had a few baby books in it, which is exciting to add to the shelf! Looking forward to: I have a doctors appointment in a few days, which is always fun. Robbie’s birthday is also this week, which I am excited to celebrate. I think I wrote this before, but I remember when we first found out we were expecting looking ahead to different milestones in my pregnancy and realising I’d be 22 weeks when Robbie’s birthday came along. That seemed so far away then! Exercise: Walking. Rearranging our living room on Friday which took up a lot of energy (don’t worry, I didn’t move anything too heavy that would be bad for baby). Working on the Pilates Pregnancy book I got as well. Books I’m Currently Reading: All.The.Books. Seriously…I finished one last week and am still working on about 12 others it seems!